Stirling Castle is one the biggest and most well-known castles in Scotland. Here are ten Stirling Castle facts. Stirling Castle is built upon Castle Hill, a massive naturally forming crag with steep cliffs on three sides. 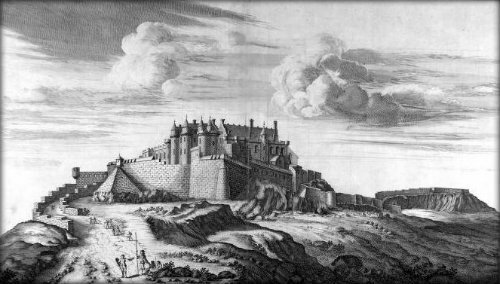 The first records of Stirling Castle come from the 12th century. King Alexander I died there in 1124, and his successor, King David I, used the castle as a royal administration centre and residence. Stirling continued to be used in this way until the end of the reign of Alexander III (1286). When Edward I invaded Scotland from England, he found Stirling Castle to be abandoned. The English occupied the castle until it was taken by the Scots in the events that followed the Battle of Stirling Bridge on the River Forth. The ownership of Stirling Castle switched several times between the English and Scots during the Scottish Wars of Independence. In 1314 The Battle of Bannockburn took place very close to the walls of Stirling Castle. In this conflict, the Scots led by Robert the Bruce, defeated Edward II’s army and eventually captured the castle. James IV, James V and James VI made Stirling Castle a key royal centre, and most of the castle buildings seen today can be traced back to the the Renaissance period. James VI grew up within the walls of Stirling Castle and his first child, Henry was born there in 1594. Following the Union of Crowns in 1603, when James VI of Scotland was crowned as King of England (James I), the royal household relocated to London. Stirling Castle was used mainly as a military centre. The War Office owned the castle from 1800 until 1964. It was used as a barracks. The Great Hall became an accommodation block and the Royal Palace became the Officer’s Mess. Today Stirling Castle is still the headquarters of the Argyll and Sutherland Highlanders infantry regiment, but no troops are actually based in the castle anymore. Massive efforts are being made to restore the buildings of Stirling Castle, and the castle is open to the public. It is visited by more than 300,000 people every year. Stirling Castle was used to represent the outside of Colditz Castle in the Colditz TV series. What next? Find out more castle facts by visiting our castle resources page.